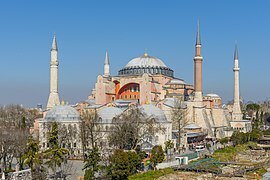 True arches, as opposed to corbel arches, were known by a number of civilizations in the ancient Near East and the Levant, but their use was infrequent and mostly confined to underground structures, such as drains where the problem of lateral thrust is greatly diminished. 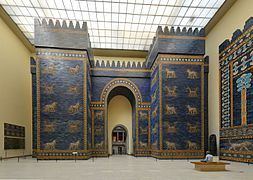 An example of the latter would be the Nippur Arch. Rare exceptions are an arched mudbrick home doorway in circa 2000BC Tell Taya and the Bronze Age arched Canaanite city gate of Ashkelon in modern-day Israel, dating to c. 1850 B.C. An early example of a voussoir arch appears in the Greek Rhodes Footbridge. Corbel arches were found in other parts of ancient Asia, Africa, Europe and the Americas. In 2010, a robot discovered a long arch-roofed passageway underneath the Pyramid of Quetzalcoatl, which stands in the ancient city of Teotihuacan north of Mexico City, dated to around 200 AD. In ancient Persia, the Achaemenid Empire built small barrel vaults (essentially a series of arches built together to form a hall) known as iwan, which became massive, monumental structures during the later Parthian Empire. This architectural tradition was continued by the Sasanian Empire, which built the Taq Kasra at Ctesiphon in the 6th century, the largest free-standing vault until modern times. Roman bridges, built by ancient Romans, were the first large and lasting bridges built. Roman bridges were built with stone and had the arch as the basic structure. Most utilized concrete as well, which the Romans were the first to use for bridges. An arch bridge is a bridge with abutments at each end shaped as a curved arch. Arch bridges work by transferring the weight of the bridge and its loads partially into a horizontal thrust restrained by the abutments at either side. A viaduct may be made from a series of arches, although other more economical structures are typically used today. A barrel vault, also known as a tunnel vault or a wagon vault, is an architectural element formed by the extrusion of a single curve along a given distance. The curves are typically circular in shape, lending a semi-cylindrical appearance to the total design. 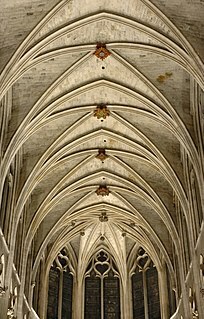 The barrel vault is the simplest form of a vault: effectively a series of arches placed side by side. It is a form of barrel roof. Guastavino tile is a version of Catalan vault introduced to the United States in 1885 by Valencian (Spanish) architect and builder Rafael Guastavino (1842–1908). The Anji Bridge is the world's oldest open-spandrel segmental arch bridge of stone construction. Credited to the design of a craftsman named Li Chun, the bridge was constructed in the years 595-605 during the Sui dynasty (581–618). Located in the southern part of Hebei Province, it is the oldest standing bridge in China. A groin vault or groined vault is produced by the intersection at right angles of two barrel vaults. The word "groin" refers to the edge between the intersecting vaults. Sometimes the arches of groin vaults are pointed instead of round. In comparison with a barrel vault, a groin vault provides good economies of material and labour. The thrust is concentrated along the groins or arrises, so the vault need only be abutted at its four corners. 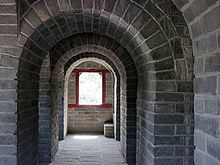 A corbel arch is an arch-like construction method that uses the architectural technique of corbeling to span a space or void in a structure, such as an entranceway in a wall or as the span of a bridge. 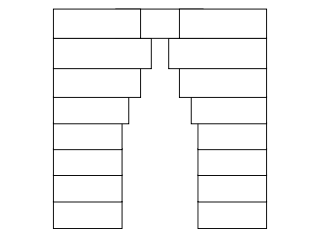 A corbel vault uses this technique to support the superstructure of a building's roof. In architecture, a vault is a self-supporting arched form, usually of stone or brick, serving to cover a space with a ceiling or roof. The simplest kind of vault is the barrel vault, which is generally semicircular in shape. The barrel vault is a continuous arch, the length being greater than its diameter. As in building an arch, a temporary support is needed while rings of voussoirs are constructed and the rings placed in position. Until the topmost voussoir, the keystone, is positioned, the vault is not self-supporting. Where timber is easily obtained, this temporary support is provided by centering consisting of a framed truss with a semicircular or segmental head, which supports the voussoirs until the ring of the whole arch is completed. With a barrel vault, the centering can then be shifted on to support the next rings. Arnold William Brunner was an American architect who was born and died in New York City. Brunner was educated in New York and in Manchester, England. He attended Massachusetts Institute of Technology, where he studied under William R. Ware. Early in his career, he worked in the architectural office of George B. Post. 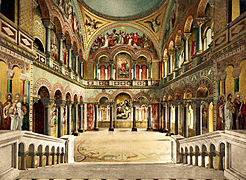 He was a Fellow of the American Institute of Architects after 1892 and was appointed by Theodore Roosevelt to the United States Commission of Fine Arts in Washington, D.C. He was a member of the New York Fine Arts Commission, the American Civic Association, The Century Association, The Engineer's Club, The Players, the Cosmos Club in Washington D.C., the National Institute of Arts and Letters, The Union Club of Cleveland, and several other organizations. In 1910, he was elected to the National Academy of Design as an Associate member, and became a full member in 1916. Brunner was also known as a city planner, and made significant contributions to the city plans of Cleveland, Ohio, Rochester, New York, Baltimore, Maryland, Denver, Colorado, Trenton, New Jersey, and Albany, New York. Brunner was, for a short time, partnered with Thomas Tryon as the firm Brunner & Tryon. The White Bridge was a Roman bridge across the river Granicus in Mysia in the north west of modern-day Turkey. Presumably constructed in the 4th century AD, it belonged in Ottoman times to the important road to Gallipoli on the Dardanelles. The structure was praised by early European travellers for its fine construction and marble facing, but was plundered for building material during the 19th century. The Bridge near Seydikemer was a Roman segmental arch bridge near the ancient city of Xanthos in Lycia, in modern-day southwestern Turkey. Its remains are located on the upper reaches of the Xanthos river, 4 km upstream from the town of Seydikemer, at a site where the gravel river bed reaches a width of 500 m. Only a 29 m long and 4.5 m wide section on the right river bank, outside the inundation zone, is left today, having once served as approach to the bridge proper. Despite its near-complete destruction, the bridge represents a noteworthy example of the early use of segmental arches and hollow chambers in bridge building. The Macestus Bridge or Bridge of Sultançayır was a Roman segmental arched bridge across the Macestus River at Balıkesir, in the northwestern part of modern-day Turkey. Its flattened arches, slender piers and the hollow chamber system documented the progress made in late antique bridge building. 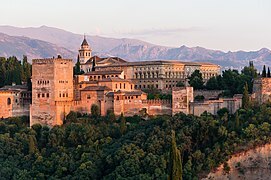 A first cursory investigation of the 234 m long structure was conducted in the early 20th century, but since then its existence has been largely neglected by scholars. Current photos from 2009 show that the bridge has collapsed in the meantime. 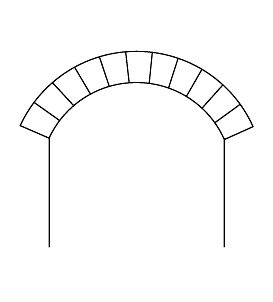 A segmental arch is a type of arch with a circular arc of less than 180 degrees. It is sometimes also called a scheme arch.